Is it safe to assume Perron is dealing with another concussion? I remember a few years back he was for a long time with one. Since I missed the story on Berglund, maybe I also missed any interviews with Mike Yeo after his firing? Nope. You haven't missed that one. He hasn't spoken on the record to anyone. At the Tampa game I noticed a new defensive scheme, both during 5 on 5 and on penalty kills. Please explain what Chief has employed versus what Yeo was using. The boys kept the Bolts on the outside for most of the night, there were a few turnovers but Binner the Winner came up big. I don't know that the system is different as much as the commitment is different. Much as a team looks faster when it passes the puck well, a defense looks better when it's on the puck more. The Blues have been better at getting rebounds out of danger and skating the puck out of the zone. That's what they were supposed to be doing all along. They've just figured out how to do it. Hockey cognoscenti may noticed more than I have. I was not a big fan of the Maroon signing at the time and I thought early on he was a detriment to the team, but as of late the 'eye test' shows to me that he's a beast with the puck down low, behind the net and along the boards. Other teams really struggle trying to knock him off the puck before he can cycle it along. Are there any advanced stats that can confirm my eye test? Thx! I was trying to find some to support that without grinding the chat to a halt and I haven't, but I'm sure they're out there and will keep looking. But the eye test is certainly valid here. Maroon has been very strong on the puck and his ability to hold on to it has allowed for line changes while the Blues kept the puck in the offensive zone which has created more scoring chances as fresh legs start going against tired legs. Jim filed this, about Schwartz and today's practice, before getting on the plane for Phoenix. 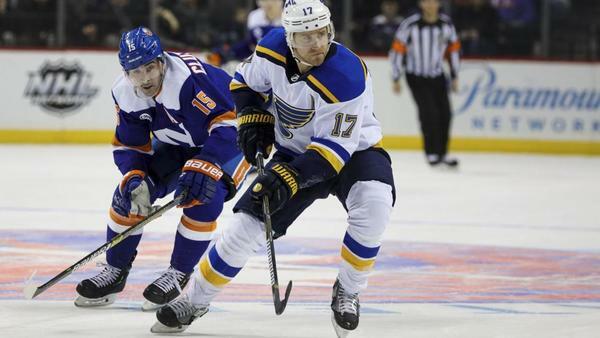 stltoday.comDuring the All-Star break and bye period, Blues general manager Doug Armstrong expressed confidence that several of the Blues' slumping core players would return to form. Last call for questions before I start writing for tomorrow's paper. Anybody got anything? "STL has allowed less than 2 xG in front of Binnington (all-situations!!) which is pretty incredible. He's been good, STL's been great." The last couple of games the Blues have played in Arizona have not gone well, to say the least. What's the prediction for the game tomorrow? The game earlier this season was a mess. The Blues gave Arizona four power plays in the first period. The easiest way to go broke would be to follow my game predictions, but the way the Blues are playing, there's a good chance they could turn it around and get a win. The New Jersey game showed they're not getting complacent. With as well as the team is playing and as full as the roster is, do you see them making any additions at the deadline? How do you think the players will feel if they stand pat? Do they expect moves to be made? Nothing big, but I also don't see them unloading players. If things stay as they are, I think Bouwmeester, Gunnarsson and Maroon will finish out the season. I think the players would be OK with them standing pat because the team is finally playing as well together as they were expected to do so it's a fairly tight group. And any acquisition who would significantly add to the team would cost either a draft pick the Blues don't have or a prospect they don't want to part with. Pietrangelo said today that he didn't think most of the players knew when the trade deadline was. (I would think the pending UFAs might know.) If there's someone the Blues can get for a mid-round draft pick, they would probably take a chance on that, but a Panarin type would cost way more than they are prepared to pay. I don't see the Blues outbidding for anyone in a trade situation. OK, there's work to do -- not that this doesn't count in the eyes of the bosses -- and a dog to be walked. Jim is with the team in Glendale and Denver and St. Paul, so he'll have you covered on those games, which will be important since those three teams all are right around the Blues in the standings. And with the Blues on the road next Thursday and Jim going to Dallas (I've got the Minnesota game the following Sunday, for those of you who care about those kind of things), it looks like I'll be here for the chat next week. And, for those of you dying to talk trades, I'd point you to Jeff Gordon's chat on Friday. He's all over that, though you'll probably have to steel yourself for some Cardinals questions as well. And for those of you who hate little surveys, I'll point you to a digital subscription. See the ad on this page.